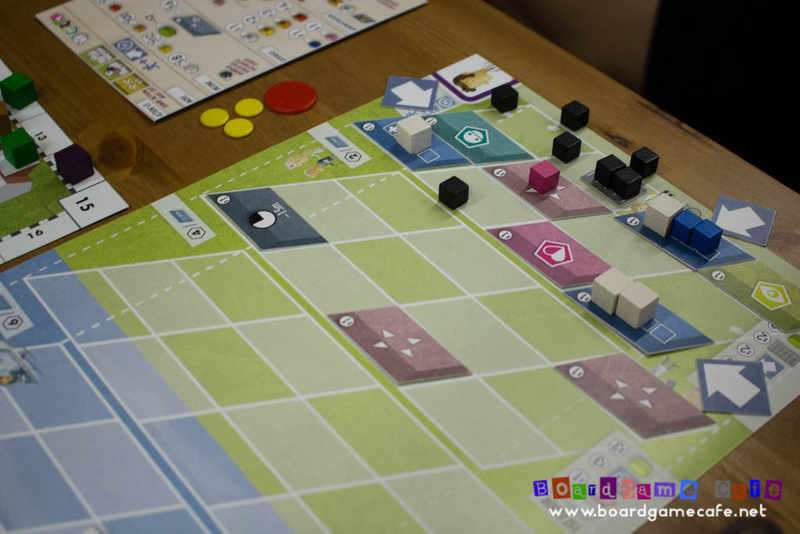 Continuing from last Fri’s Rahdo’s Top Ten Heavy Games, this week saw us go thru the 2nd batch of games in the list namely CLINIC, KANBAN, ALCHEMISTS and MADEIRA. 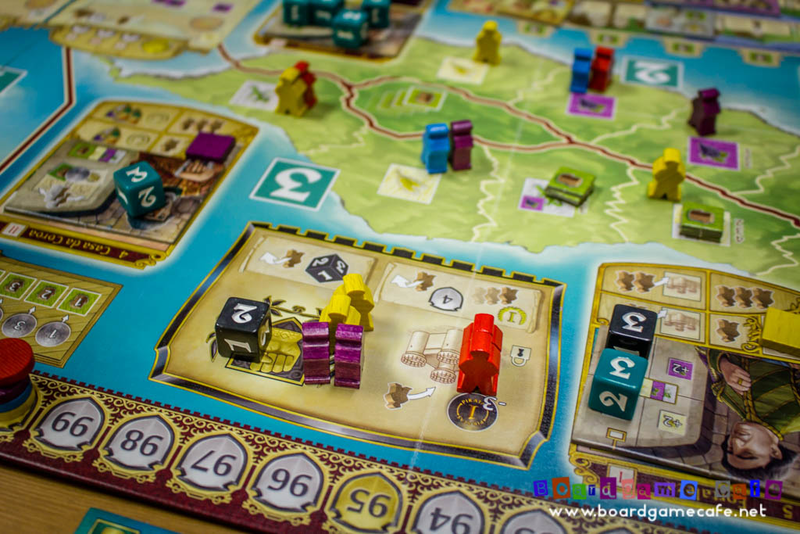 Last week we covered the even sequence of games in Rahdo’s Top Ten Heaviest Games list (Agricola/Caverna, In the Year of the Dragon, Brass – read Part 1 sessrep here). 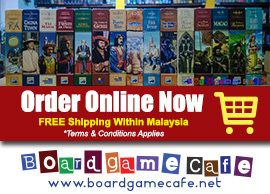 This week we continued with the odd sequence in the list with the exception of ATHLAS which none of the OTK group owns. Still that’s four solid Euros to pick from for today’s session ie Clinic, Kanban, Alchemists and Madeira. 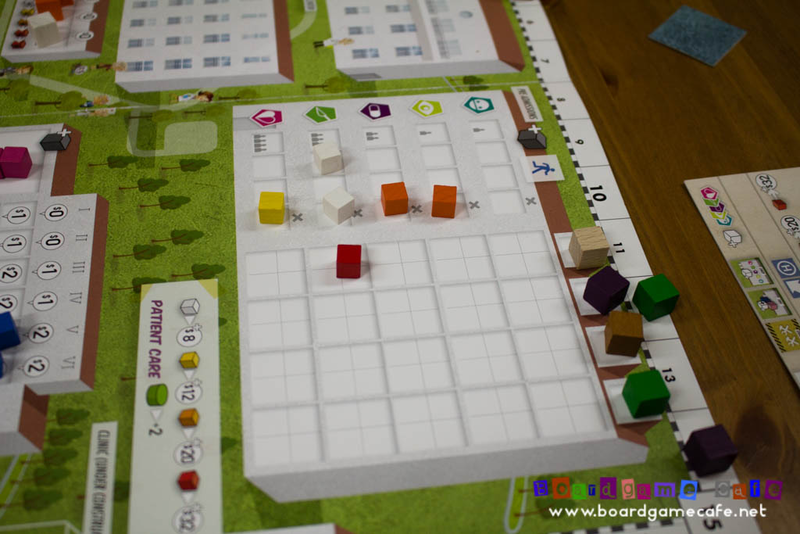 CLINIC plays 4 – and I suspect that’s the sweet spot as there’ll be strong contention for the common resources like doctors, nurses and patients – and except for Dith, the rest have not played this game before. 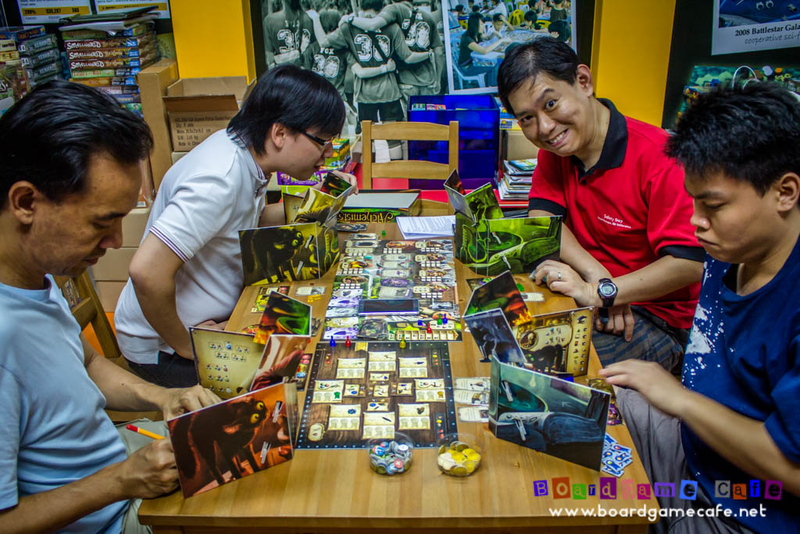 I won’t go into describing nor reviewing the game (Clinic) itself in this report. 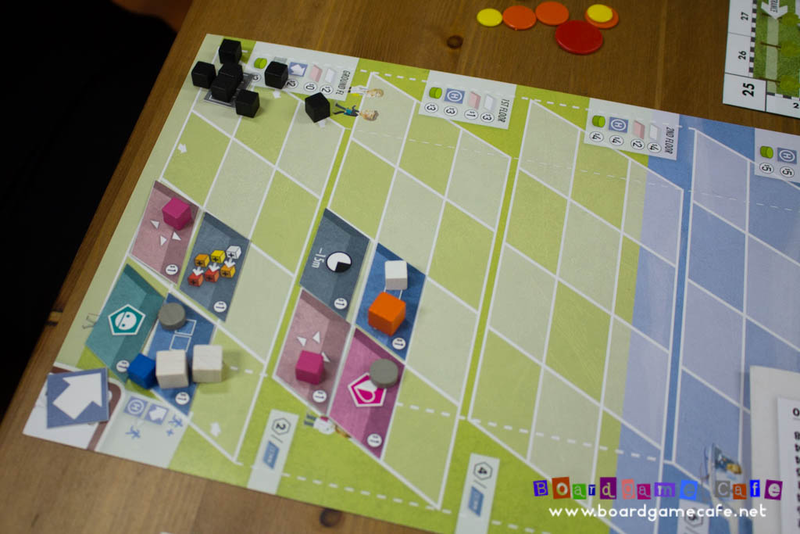 If you are not familiar with this game, do read my review write-up of the CLINIC session we played earlier this year. 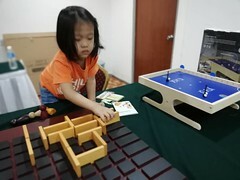 For this report, let me share my thoughts on the different approaches / strategies the players applied to this session. There were two rules we didn’t get right in our last session that can be easily missed. 1) Doctors who were not hired (from the university) would improve their level. This would make them more attractive to be hired next round. 2) Patients in the right-most column of the Admittance Queue are removed from the queue at the end of the round, but they are not discarded. Instead they are returned to the Patients Pool (and can re-drawn for future admittance). This resolved the “patient scarcity” issue we’d in the last game. In this session, I noticed there were a few “severe” patient cubes ie orange / red coming out earlier in the game. The revenue difference between the least critical “white” patient and the most severe “red” patient is very significant ie $8 vs $32 so those able to set up their clinic to capitalize on the flow of red patients – especially if they arrive earlier in the game – would gain a good advantage. The round (above) looked a possible lucrative round – two oranges, one red – if one is able to treat those patients. We also discussed how the Extreme Consultation room can be used as both an offense and defense in the situation where a lucrative patient appears on the Admittance Queue but one’s clinic is not yet set up to admit those patients. In my last play of this game, I remembered how painful things can get if your hospital is not set up to properly manage “flow”. You’ll end up shuffling doctors & nurses back-n-forth between laboratories and various treatment rooms. Each of the “5 min” time cost do add up towards end-game and you suddenly find you have spent 2+ hours over the most efficient hospital in the game… with each 15-min bracket a loss of 1 VP, that’s a possible 6-8 pts swing. In this session, Purple is opening a time efficiency advantage over the rest especially Green after just 4 rounds of play (there were 2 more rounds to go). When we discussed this, we realized that most of us tend to go for diversification ie building as many of the 5 treatment modules as we can so that we can admit any patient from the 5 queues; basically staying flexible to the “market” demand. That might be a good plan. However given the constraint placed on the building flow, it can also be a bane on your time efficiency during the late game stages. It might be good to focus on 2-3 treatment services and set up the doctors & nurses to optimize the patient flow. 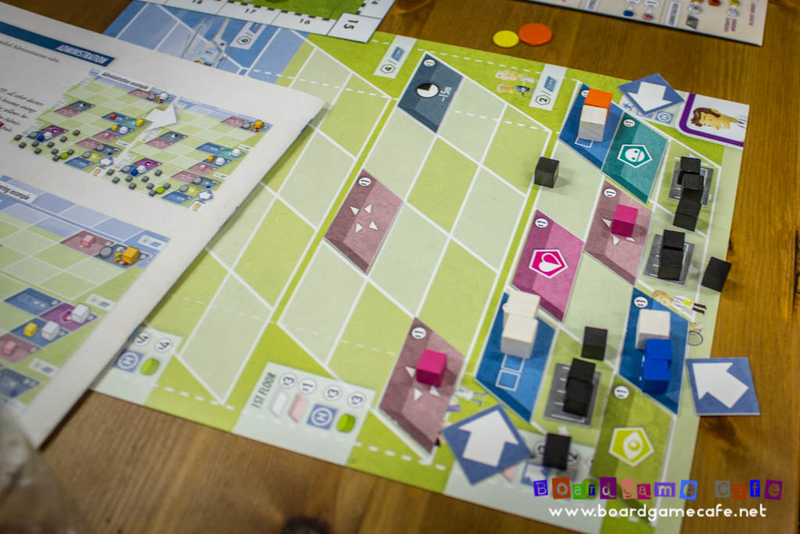 CLINIC has a solo variant so I might be tempted to do a solo game to try and see if I can optimize a hospital building plan based on this thinking. This hospital (above) looks “well-planned” and neat. Car parks were moved to one far corner. The downside obviously is a little of overplanning and as a result, the hospital was providing two services only while other competing hospitals were already offering 3+ services at this juncture. This would impact the revenue flow for this hospital… which has dire impact on one’s Popularity score (ie VP in this game) since you can only buy Popularity points from the profits you made in each round and not from leftover cash. You can’t stockpile your cash and hope to convert them all to Popularity points at end-game. 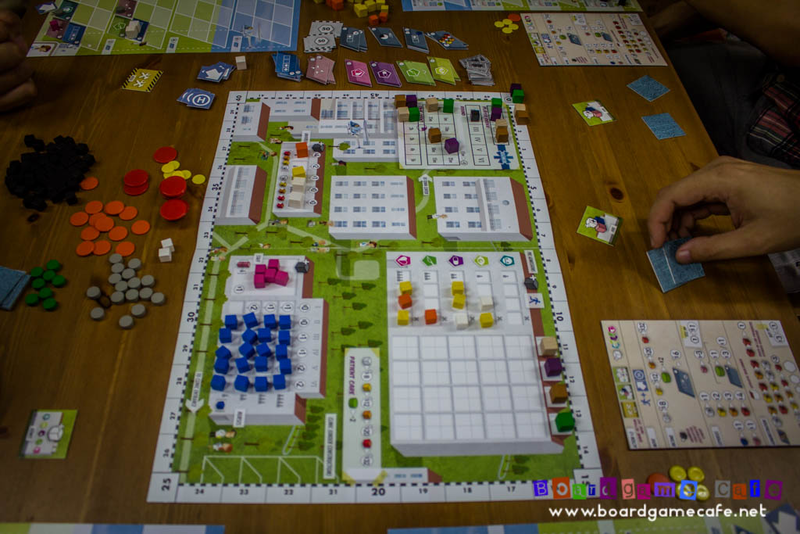 Here’s the board for another hospital. Kaz was on an ambitious plan to lay down three separate blocks of building and at the same time trying to spread out the car parks, optimizing the “dead” space on his land but he soon found the parking issue escalated quickly, and had to spend a few build actions to get proper car parks to manage the incoming cars. There’s also another interesting observation I would like to draw from his building setup. This is Purple’s board and if you recalled in a pic earlier, Purple has the lowest time spent; the differential between Purple (least) and Green (most) was close to 2 hrs (that’s a swing of 8 pts). Purple has set up 3 entrances to his hospital and it looked like he could bring a new patient into his treatment rooms in 5-10 min max. Doctors & nurses are already in-room or nearby so they are already ready to start treatment. Added to his Waiting Room module (which saved 15 min per round), Purple’s clocking a low 20ish minutes per round while the other players were easily doing > 60 min. Would be interesting to see how large an impact this flow-efficient building plan worked out for Purple in the end. Purple’s downsides were 1) lack of heights in his buildings and 2) lack of higher skilled doctors (or more nurses) to take in the more severe patients to rake in the money. (1) was not much of an issue since height bonus comes at 2-4-6, meaning if you managed to build all the way to the 3rd floor, you gain max 12 pts but building high costs more (which means you get less money to spend to convert to Popularity points). (2) might be a more pressing issue as the profit gap between a white patient and red patient is quite significant, and where Purple gained on time VP, he may lose back on money-conversion VP. This was Dith’s hospital towards end-game. He only managed two blocks of buildings; car parks were overflowing preventing him from a possible 3rd block. 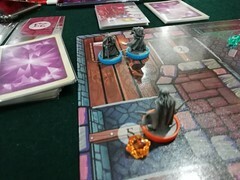 However he has a good mix of skilled doctors in his clinic and that did matter as he raked in $80+ of profits in the last turn which converted to close to 20 Popularity points (after paying expenses). Furthermore the higher skilled doctors in his clinic contributed to higher end-game bonus (eg a red doctor is worth 5 pts while a white doctor only 2 pts). He has two Laboratories, and has been tapping them for 2 VPs per round. 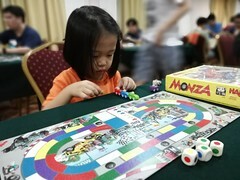 This game provided plenty of learning points for me, who was just observing from the side. In my first game (sessrep here), we were all doing basically the same thing; trying to build all the service modules, trying to build higher (for the building bonus), trying to get the 2nd and 3rd building blocks (some of us only managed the 2nd block), and admitting & treating patients as fast as possible. 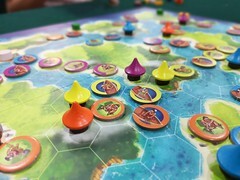 This game saw a wider variety of strategies in play; whether intentional or accidental I wouldn’t know (and didn’t really matter) but it helped me appreciate the layers to this game. Kaz showed how one can possibly focus on a few service modules, maybe 3 – and set up a very efficient admittance flow where patients spent minimal amount of time moving from Pre-Admit queues to being treated. At the end of this game, Kaz basically opened up a 2+ hrs time gap. The use of the laboratory – and the 1 VP it gave you whenever you use it – was one of keys to Dith’s win given he has not just one, but two labs. Not to mention, frequent use of the lab meant you have more higher-skilled doctors in your clinic hence able to treat the more severe – and highly profitable – patients. His $80+ revenue at game end was an indicator of how much profits one can make if you manage the admittance queues well. While no one actually build an Extreme Consultation module, we now have a better understanding of how it can be used not just for a quick cashflow option but also to deny the profitable patients from your opponents. A white patient earns $8 – but you need to deploy doctor and move the patient into the right service room (costing you time) – yet the Extreme Consultation module earns you $6 quickly (without time penalty). CLINIC is not just about building as many modules as you can fit into your hospital. Nor about building the best looking hospital. It’s about planning ahead and understanding how you wish to set up your hospital’s building blocks to gain maximum efficiency (time flow) and profits towards end-game. We have not yet played any of the expansion modules so there are more things for us to discover in this wonderful game. 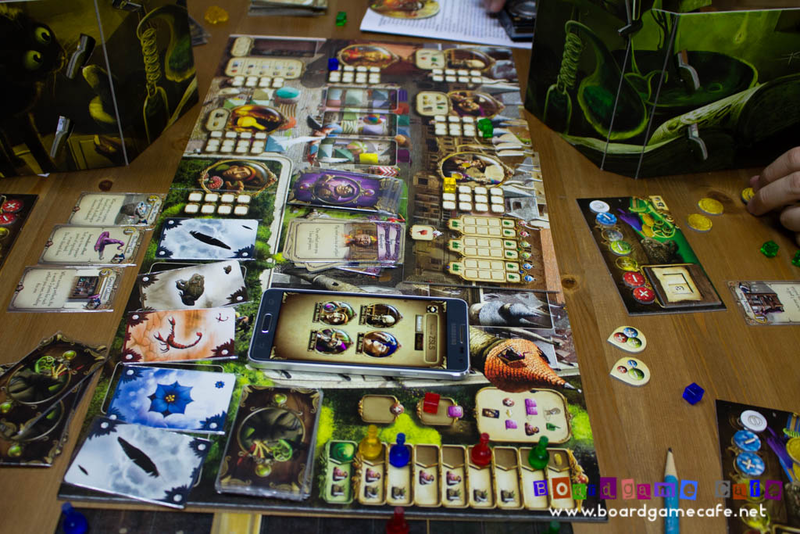 The very busy – yet colorful and I’ve to add FLAVORFUL – Alchemists game board. 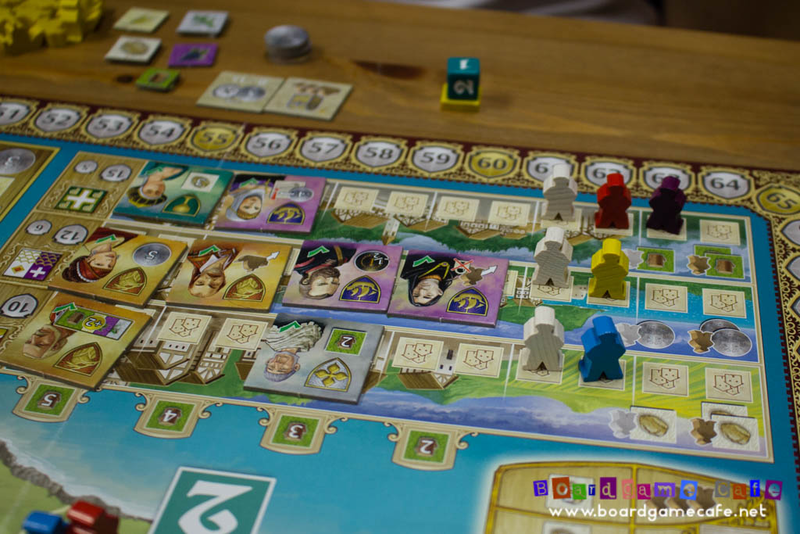 Each player have their own deduction board as well, and this time we are playing with the “corrected” tokens – which CGE was kind enough to ship to all customers who bought a copy at Essen. 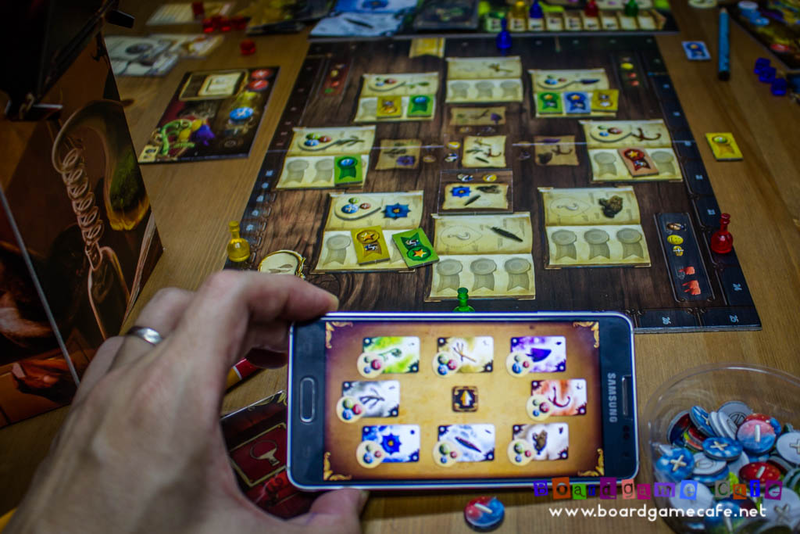 The app that’s a mandatory game accessory for this board-app game. This group shared a single smartphone so if you are wondering if all players need to have their own smartphone, it’s not necessary. I think there’s an update to the app on April 10th, hope they were using this app version (see update thread here). I still remembered the longish rule briefing session from our first game. 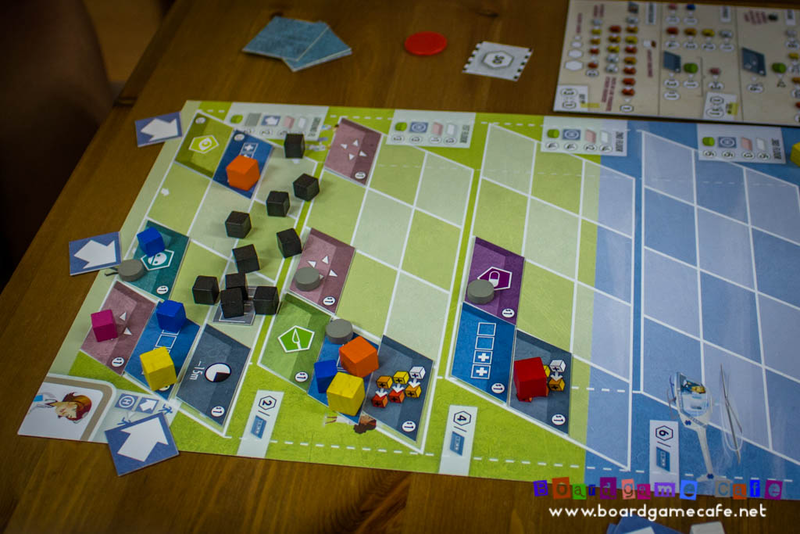 This time around, it was a much quicker and more streamlined rules walk-thru, probably because Ivan now has a better grasp of the game flow and is able to structure the rules walk thru in a more logical manner. The game does not contain complicated rules, it’s just that we still need to cover each section / region / character abilities and they all intermesh. For this session, we replaced the standard Harvest section with the Harvester promo card (available from Spielbox magazine). I agreed with Ivan the Harvester offers a better option and now makes all five buildings equally useful, their usefulness obviously depends on which path you are taking. 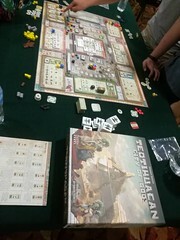 There was minimal tapping of the Pirate dice in this session. I was the only player actively using the Pirate dice in the earlier rounds, and a few others do join in later. 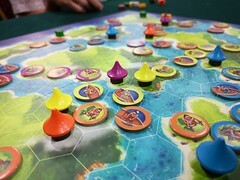 This is in contrast with our first game where we often see all 3 pirate dice in play each round. I liked how the turn order / favor track is two-layered. The first layer is where players who pass first (ie take no further actions in that round) gets to choose their turn order (which also comes with either cash or bonus action benefit). 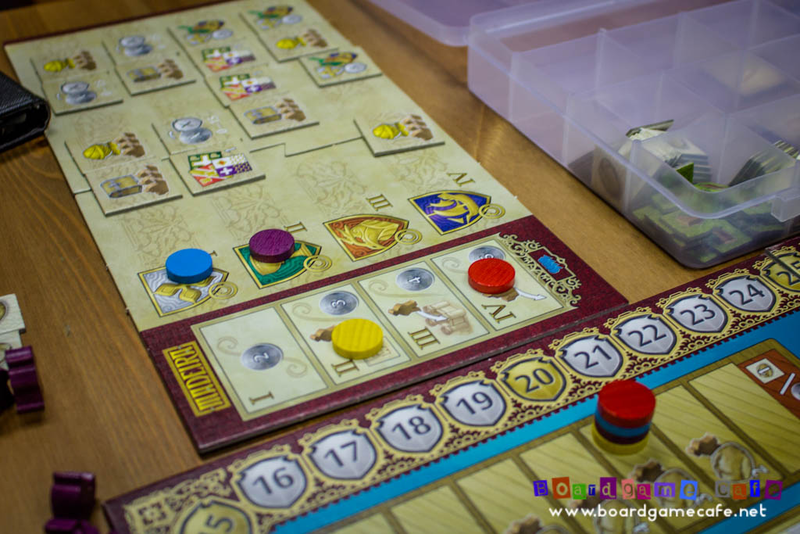 However this is not the playing turn order for the next round but merely the turn order to have first pick of the set of dice; and the row where you pick the set of dice from would then determine your playing turn order. The City getting crowded (as usual). 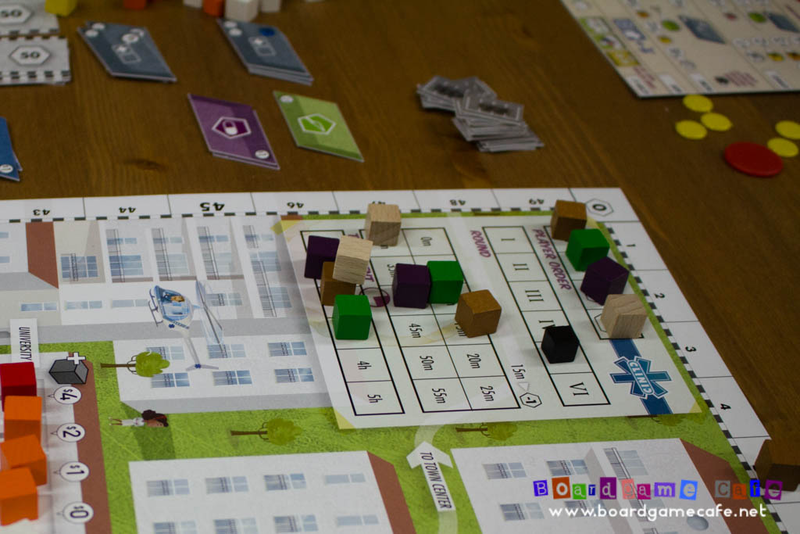 The City is a quick-n-easy way to get resources (wood / grain / money) and it’s also one of the easier Favors to score. The cost to doing this is merely committing your people – albeit you have a limited 12 headcount – into the city space. 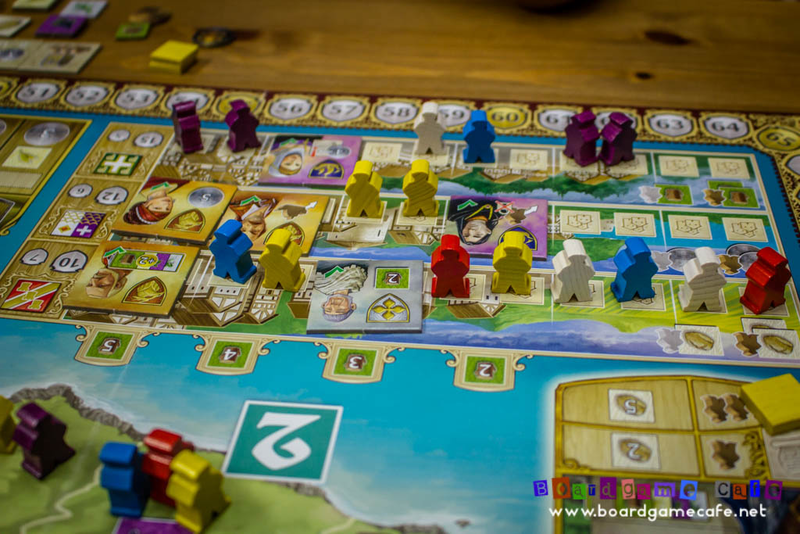 Playing MADEIRA again reminded us how rich the game is, and it certainly is up there as some of the best Heaviest Games list and deserving the No. 1 spot in Rahdo’s list. 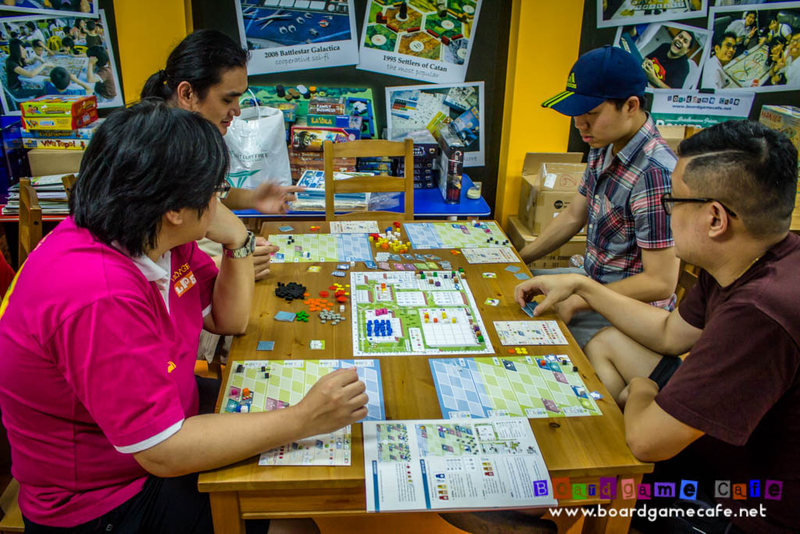 The good progress I’m hearing on NIPPON’s playtesting – the next game from these two designers – would mean it will be ready for this coming Essen. I personally can’t wait to play it! Looks like we managed to do 3 games from Rahdo’s list this and last week – so that’s 6 games played, 4 games not done. 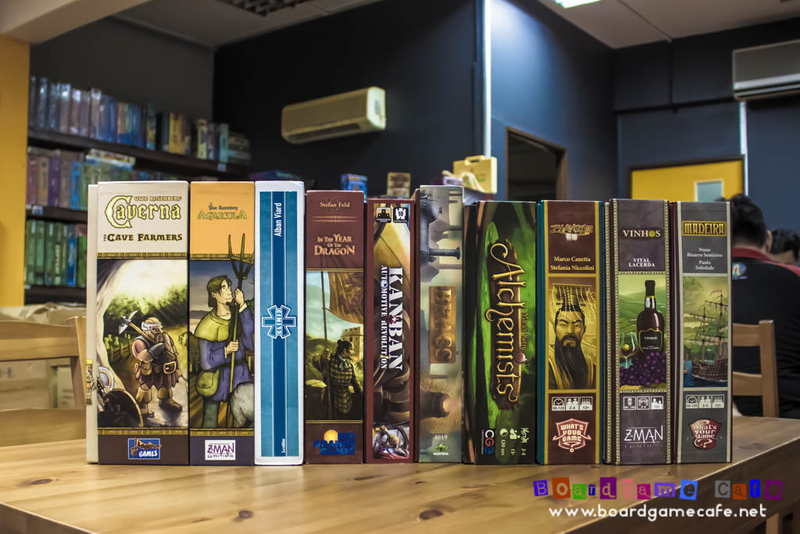 The games we missed out are Athlas (coz we do not have this game in our library), Agricola (we did Caverna instead), Kanban, Zhanguo and Vinhos. I think it was fun going thru another person’s Top Ten List as our Meetup Theme. 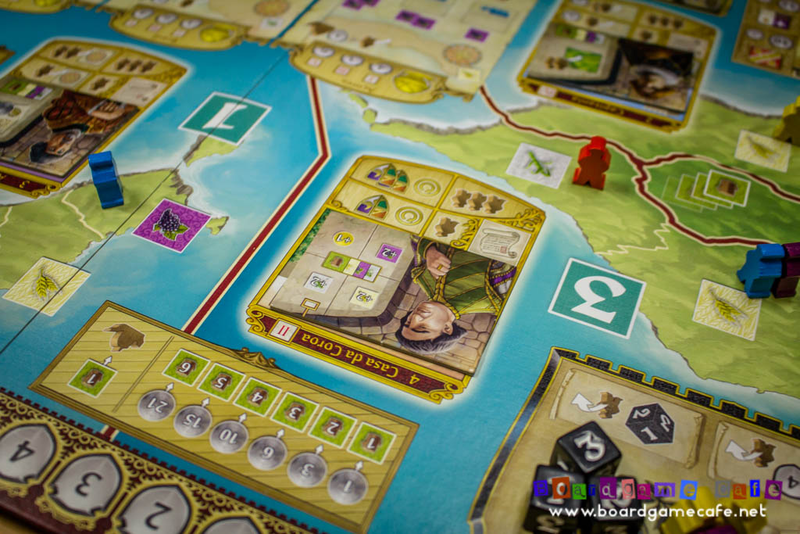 It offers us a different mix of games to play thru and often re-introduces an older game back to the table eg In the Year of the Dragon, Brass (and would-have-been Vinhos). Hopefully we can find more good / interesting Top Ten List to use for our future meetups or perhaps we should poll the OTK Gang’s Top Ten Heaviest Games and play thru that?